Welcome Warriors (and mundanes) to the IKV Melota Website. After four years (two elections) of experimentation, this is once again the "official" IKV Melota web page. It will take some time to correct four years of neglect. Please be patient. 1704.20, somebody hacked the website. After discussing this with hosting firm, we decided that the nuclear option was best. I nuked it from orbit. It was the only way to be sure. This site is being totally reloaded. There will be a lot of broken links until I get it completely reloaded. As of 1807.06 I am retired and moving too far away from DFW to be an active member of the IKV Melota. The home of my new life does not have Internet access or even cell coverage. I can no longer maintain a living web page. This is now, voluntarily (this time), a LEGACY website. 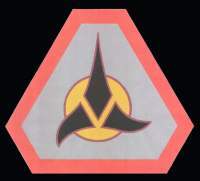 This site is paid for until August 2019 in order for any klingons to contact and acquire 20 years of history and movies from this website. If you encounter a dead link to some page or movie that you wish to see, send me an email and I can get it onto the website. The new Holme was purchased in 2015 so the demands of building a new life pretty much ended AERs in 2017. Ship's Academy Information on "HOW TO"
"Other" Page This is a page of items that don't have a classification. I wrote the commentary about having an updated and working website. And, yes, you will find some dead links here. The pages themselves are going to be up to date. The links that fail will be less important. The IKV Melota is a non-profit organization supporting Mr. Roddenberry's vision of the future. We find it very distressing that Viacom and Paramount do not share his visions. We recognize all trademarks and copyrights as belonging to their owners and hope that the owners have sense enough to realize that we fans pay the bills. There is no need outside of testosterone and rectal attitudes to pursue fan sites. Given that this is not a commercial venture, as webmaster, I partake of the KISS principle and shall have a very simple site. Simplicity is beauty, like the curve of the Ba'Leth.